Husband and wife team Stewart and Athena Boedecker created Boedecker Cellars in 2003, and they have been crafting wines focused on quality, finesse and loyalty ever since. After having lived abroad in Europe for two years, Pacific Northwest Natives Stewart and Athena Boedecker returned home to found Boedecker Cellars in Oregon's revered Willamette Valley. After five years spent honing their craft at the Carlton Winemaker's Studio in Carlton, Oregon, they built their winery in the heart of industrial Northwest Portland – just a stone's throw from downtown and yet just 40 minutes from the vineyards– where they continue to make their acclaimed wines from Oregon's Willamette Valley. When you visit Boedecker Cellars today- weekends, midday or evenings, you will likely encounter Stewart and Athena in the cellar tasting through barrels and tending their small lot, world-class wines. Guided by both tradition and science, Boedecker Cellars use minimal intervention techniques in their winery. Every stage of the process is done by hand, including harvesting, sorting, punching down and racking. Fermenting with native yeasts lets the winemakers highlight the unique qualities of each vineyard, bringing every aspect of terroir into the cellar. They taste, blend and taste some more, age Pinot Noirs for a year and a half in barrel, bottle, and release the wines six months to a year later. 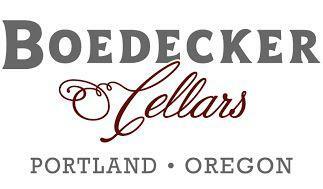 Boedecker Cellars in a community made up of dedicated and hardworking folks. Their winemaking team consists of Stewart, Athena, friends and family. During harvest, everyone helps, putting in 12- to 14- hour days in the cellar, sharing the craft and creation of their wines. Wine Spectator 91"Firm and focused,this is deftly balanced,letting plum,blueberryand hibiscous flavors push through the layer of fine tannins that veils the finish . Lingers pleasantly. Drink now through 2022." Wine Spectator 92 "Fresh, taut and vibrant, with crisp tannins around a core of mineral-accented raspberry, cherry, earthy and floral flavors, finishing with a moderate grip. Has intensity without excess weight. Best from 2016 through 2022. 1,200 cases made"